Note: Click on any image below to see a larger image. NMM 6097. 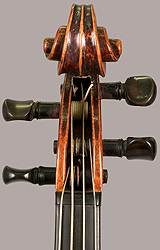 Violin by Matthäus Ignatz Brandstätter, Vienna, 1824. Rawlins Fund, 1997. In original condition with its original label. 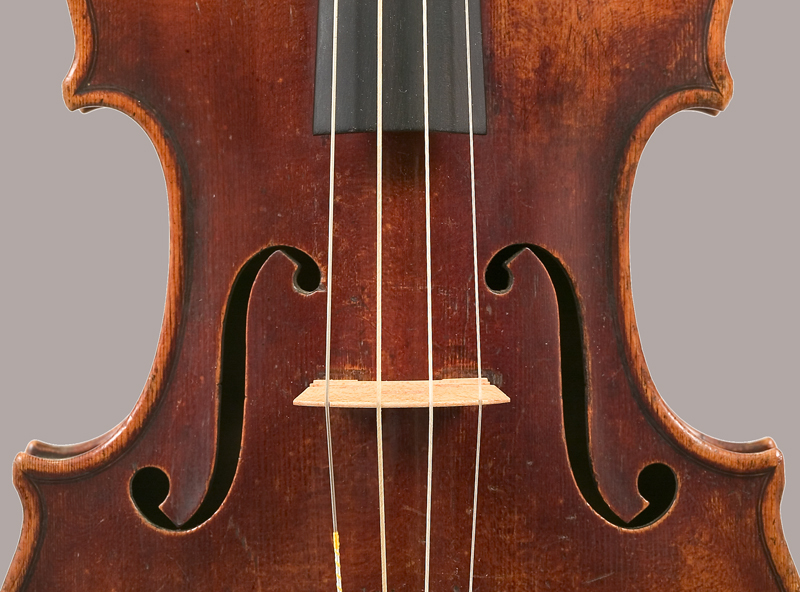 Brandstätter, whose violins from the 1820s and 1830s demonstrate exemplary workmanship, was one of the most prolific Viennese makers of the time. This example was built in 1824, the year that Beethoven's Ninth Symphony was first performed. Viennese string players of the time almost all played Austrian instruments--not those of the Italians. Paper label, engraved, with cut lower corners, the monogram stamped in black ink, and last two digits of year written in black ink: Matthæus Ignatius Brandstætter / [MIB monogram] fecit Viennæ Anno 1824. Top: two-piece, quarter-cut spruce with fine grain, widening then narrowing toward the flanks. Back: two-piece, quarter-cut maple with medium curl descending from center joint. Ribs: quarter-cut maple with medium curl angled to the right. 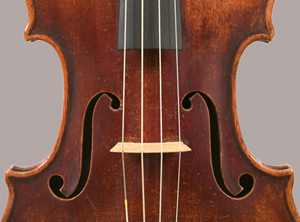 Head and neck: maple, medium curl; pin hole in heel of neck, to bass side of center. 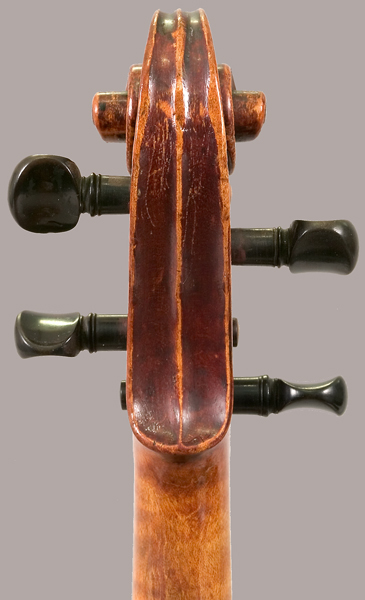 Fingerboard: ebony; slightly wedge-shaped; no channel over neck position. Pegs: four black-stained boxwood with mother-of-pearl eyes, the heads with a round-oval shape, the edges slightly rounded off. Saddle: ebony; narrow; extends into top portion of rib; rounded bottom edge, so that saddle is symmetrical along all axes. Original, very narrow bassbar. Early soundpost. Narrow parchment strip glued along back joint. Top probably never removed. Chin wear to varnish on bass side of tailpiece. 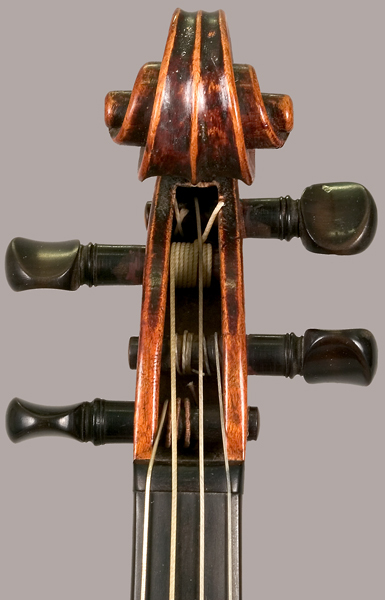 The Museum's Brandstätter violin retains its original scroll and pegbox with pegs made of black-stained boxwood and mother-of-pearl eyes. Upper bout width: 168 mm. Center bout width: 109 mm. Lower bout width: 209 mm. Vibrating string length: 322 mm. 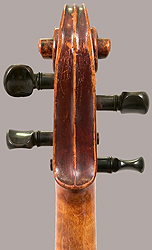 Original neck length (bottom of nut to ribs): 130 mm. Lit. : André P. Larson, Beethoven: Musical Treasures from The Age of Revolution and Romance, with essays by John Eliot Gardner, William Meredith, and Gerhard Stradner, exhibition catalog, Bowers Museum of Cultural Art, Santa Ana, California, January 30-March 21, 1999 (Santa Ana: The Bowers Museum, 1999), p. 7. André P. Larson, Beethoven & Berlioz, Paris & Vienna: Musical Treasures from the Age of Revolution & Romance 1789-1848, with essay by John Koster, exhibition catalog, Washington Pavilion, Sioux Falls, South Dakota, September 12-November 2, 2003 (Vermillion: National Music Museum 2003), p. 30.